Great article and exactly what IPsoft has been doing for IT and Business processes for several years now. Its great that influential analyst firms like HfS are picking up on this trend and discussing it as another option versus the offshore providers. That was a funny blog! So I guess once we get processes standardized to a certain point, we eliminate ourselves? Isn't it incredible how upset people get about jobs "moving offshore", however, when they can be eliminated with software technology, everyone simply accepts it as "innovation"? Interesting post and as one comment made... its been around for a while. The big if is that its suitable for commodity competitive processes (assuming that they are properly defined and have been normalized for efficiency). On the other hand one has to consider the impact that it has on the human-robot interface where humans aren't particularly endeared to automation interaction. The challenge here is the uplift and optimisation of processes to allow use of this capability, before one starts to discuss whether labaour arbitrage or automation can bring benefit (and it really isn't an either/or). This effort really needs to be driven by the business strategy, not tacked on as a way for a solution to find an application. I believe the uptake of automation depends heavily on guiding the customers in the required change to leverage the capability. I also believe the supply of innovation will grow and innovate heavily, and that the specific technology will become less and less relevant as a USP. Since the first waves of outsourcing the candidates for lift and shift are thin on the ground. The challenge lies in the application, not the creation of the tooling itself. In my opinion, automation players may be stuck between CFOs who are cold to the technology-laden presentations and the operational teams who recognise that automation takes one level of rationalisation further than previously touted outsourcing deals, and the challenge that represents. Focus on the whizziness of the solution is likely to be a non-starter as more and more players enter the market with their own solution. Often the real meat of the benefit comes from the transformative event that is a pre-requisite to succesful outsourcing. Indeed, I have encountered clients who value the transformative exercise required to outsource more than the outsourcing itself. 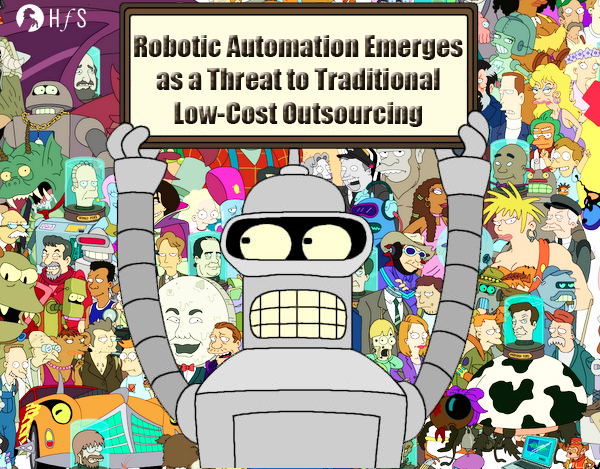 Without a business-relevant consultancy capability attached that can enact the changes required for the client to leverage these technologies (and may even recommend against the application of the technology in some cases), I believe automation risks running the same, oft-lamented course as traditional outsourcing. Please note, I give an opinion on the overall sector based on my understanding, not on the company referenced or any others in the sector individually. Great to see the reactions here! We acknowledge that the Blue Prism is only one of what we expect to be a growing array of vendors delivering robotic automation solutions. And HfS has long noted the irony of bashing outsourcing while overlooking how automation eliminates far many more jobs. One theme on which my report focuses is the challenge of selling such solutions internally. Our case studies show how the economics and timeliness of the solutions were what won the day, not their technological glamour. I agree the longer-term play will be express their value less tactically, more as part of a continuum of solutions that includes a range of sourcing alternatives and traditional IT-driven automation. There's clearly room for providers to lead the way on this. I think there's perhaps a stronger argument to be made for robotic automation in agile software development terms: it is fundamentally iterative and close to the target business process. I imagine we are just at the beginning of an era where such tools and methodologies develop to the point where we all become software engineers to some extent. Great article. For further proof of the drive of robotics and automation its worth checking out what is happening in the large data warehouse, BI and Big Data marketplace. Automated data integration, code migration, test driven development all wrapped up in an agile delivery is now available on the most robust warehouse platform. Check out Agile Solutions ETL automation suite. @James - one comment, process optimization/screen automation is here for a while, over a decade. The distance from the traditional automation to RPA is not too far. The consumption that Blue Prism are the only RPA player is actually far from being true, although their aggressive marketing approach can make one believe this is the case. Many large enterprises in Americas and EMEA regions actually utilized robotics with other technology vendors for a while. A fair disclosure, I am hired in a company which RPA is part of its portfolio. You need to watch out for how words can colour a debate. Automation -- something that manufacturing discovered decades ago -- is now reaching services. That's all there is to it. But when you chuck in words like Robot or Robotistan into the mix, the debate becomes more emotional than necessary.